Missives from the Art World: Family Lore: Fact or Fiction? When you grow up in a family business that is over 140 years old there are lots of stories handed down about great moments of family history, in my case great works of art that passed through our hands. For any of you that have reached a stage in life when you become more interested in your family’s history it is exciting when you can relive and learn more about those stories you heard as a young person. Recently, I had such a chance. Even before I joined the family firm I heard a story about the Director of the Morgan Library, Frederick B. Adams, Jr., who was asked by Saemy Rosenberg and Eric Stiebel (cousins and partners in the firm of Rosenberg & Stiebel) to come to the gallery to see some manuscripts that had been recently received on consignment from the Rothschild family. Mr. Adams told my father that he would be happy to come but the Library had no money to buy anything (something I would hear often from museum people over my career) Now, of course, a dealer is looking to sell, he has to in order to stay in business. But there are other reasons to discuss acquisitions with scholars and other interested parties . Be they private or institutional they may have additional expertise in what you are handling. You want to see if the client is as excited about the acquisition as you are. The potential client may not be able to buy now but may know of someone else who could be interested. At the least, they will realize that this is a dealer to keep in mind when looking in the future. Therefore, my father and his cousin were delighted when Fred Adams arrived. Fast forward half a century to the wonderful exhibition “Demons and Devotion: The Hours of Catherine of Cleves” that opened at the Morgan Library ten days ago (running through May 2, 2010). The original book of hours created in Utrecht, circa 1440 was split into two volumes in the mid 19th century. One sold to the Arenberg family and the other to the Rothschilds. The Morgan has taken the two volumes totally apart in order to make a facsimile edition, do a terrific exhibition, and rebind the manuscript into a single volume with the pages in their proper order. Witnessing the new interest in provenance, a large wall label at the entrance to the exhibition details the history of the Arenberg half as it passed through the New York book dealer H.P.Kraus to the collector Alistair Bradley Martin, before its acquisition by the Morgan. No mention was made, however, of Rosenberg & Stiebel in the provenance of the Rothschild volume. Could the story I had been told be inaccurate? I went the next day to the warehouse that houses our archives to investigate. There I found the notes dated March 25, 1963 (written to send to the third partner in our gallery, my uncle, Hans Stiebel, who was living in Paris) recording Frederick Adams’ visit. 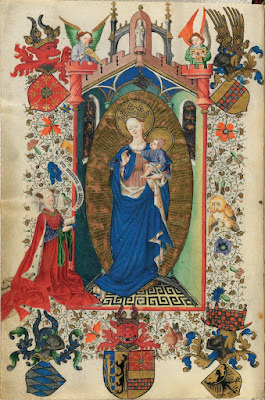 He had said that he believed the Catherine of Cleves “could not be compared with all of the other manuscripts shown to him” and said it was the only one he was interested in for the museum. He noted that it was very similar to one that had come through the Arenberg Family to the well known collector Alistair Bradley Martin. Later he was able to show that they were actually part of the same manuscript which had been taken apart in the mid 19th century. It was noted that in discussing the price with Saemy Rosenberg, he said “Any request for a reduction might be accepted or refused, or the book might be withdrawn altogether”… the work was put on reserve for the Morgan. Then with the backing of the Morgan’s president Henry S. Morgan the manuscript was acquired for the Library. In 1964 the Morgan Library did an exhibition of both of the manuscript sections, borrowing the half that belonged to Alistair Bradley Martin which they were subsequently able to acquire. In his personal invitation to the opening, Frederick Adams wrote that they would use “full-size illuminated color transparencies of all 157 miniatures rearranged in their proper sequence, so that no visitor need be frustrated by being unable to turn the pages of the actual manuscript”. Today you can turn the pages of the newly –published facsimile volume placed at the center of the gallery. And you can compare this state-of-the-art reproduction with the dynamic perfectionism of the original, each page of which is displayed in cases or on the walls. It is literally a once in a life-time opportunity. 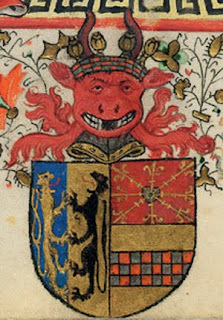 For me, there is an added thrill: verifying my family’s connection to this most exquisite of medieval manuscripts.